Nancy Kilpatrick and Caro Soles bring us: nEvermore! : Tales Of Murder, Mystery & The Macabre – Neo-Gothic Fiction Inspired By The Imagination Of Edgar Allan Poe. This collection was like discovering Poe for the first time all over again. And I’m shocked to find myself stating such a thing. Poe is one of my most beloved authors, first discovered as a very young man, and that was some time ago. I expect most of us who love Poe share the experience of discovering this at a very young age. After all, if one has ever taken an English class, then one has been introduced to Poe. And also like me, I expect most people have found it very hard to recreate that joy of first discovery. Not that I haven’t discovered many great authors and their works since, because I certainly have (some have stories in this volume), but Poe’s works have a very unique and special feeling to them that I’ve never found anywhere else. Perhaps some of this comes from the fact that I was so young when I discovered him, at least this is what I always thought up until now. There have been any number of Poe theme’d anthologies over the years, and a near infinity of authors whose publishers trumpeted them as the next Poe. So I am always extremely wary when something new comes along invoking the name of this great writer. Needless to say, I approached this anthology with great caution. However, the line-up of contributing authors is such a list of luminaries that I had to give it a try. Nancy Kilpatrick and Caro Soles have been loose on the reins with the authors. 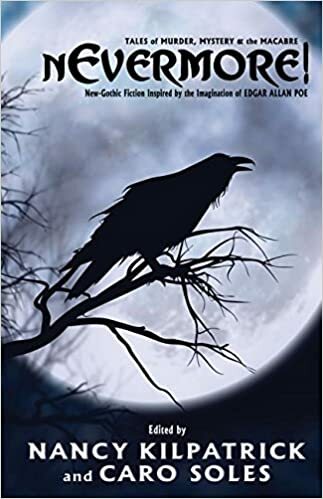 Each story starts with an introduction to the story by the author where they explain their own experience of Poe and why they’ve chosen a particular aspect of that experience to create their story. I think this way of doing things has created a magic formula of sorts. Every reader has their own very personal experience of Poe, and by letting these authors tap into their own personal experience, the result is a collection that feels deeply intimate. I believe it is this shared experience that invokes the anthology reader’s own personal history with Poe. It felt like I was reading a newly discovered cache of lost Poe stories, like a continuation of what I first felt so many years ago. I will make no attempt to breakdown the stories or to rate and rank them. Dissection would be a disservice, perhaps a sacrilege. There is only one way to read this anthology: jump in, submerge, return to that misty and half-forgotten realm of youth and experience the joy of discovery once more. I can’t recommend these stories highly enough. This entry was posted in book review, Edgar Allen Poe, Edge, fantasy, fiction, horror, literary fiction, Poe, Uncategorized. Bookmark the permalink.